For generations music barriers have been broken. The Black and Latin communities have certainly paved way in the music industry throughout the years. However, being one who paves the way always faces much to the plate. Being of Asian decent and being marketable in the music industry til this day is still a burden for many struggling artists. Since mainly being White, Black, or Latin is much more marketable they are more acceptable to the market of music some Asians have been able to break through such as Apl.de.Ap of Black Eyed Peas, Chad Hugo of the Neptunes, Utada, and Coco Lee. However, one artist that comes to mind as an international success is the one and only Jocelyn Enriquez. She shines across stages, dominated charts, won numerous awards, and landed a cameo in a major motion picture. Jocelyn was truly amazing during her time. Born of Filipino decent and raised in the San Francisco Bay Area. At the age of 3 she was heard singing along to the disco classic “Ring My Bell.” That later followed by her joining the San Francisco Girls Chorus, soon after that she joined the San Francisco Opera Co. til she was a teenager. Soon she joined a few groups such as Pinay Divas but soon decided to followed a solo career. Being that Jocelyn is Filipino (which various of its dialects use Latin words) decided to record “I’ve Been Thinking About You” in Spanish. This was also a popular strategy for Freestyle at the time. However, the idea turned chaotic. She was labeled as a sellout in the Filipino community for doing such a thing. It also made assumptions for those that never saw Jocelyn to be of Latin decent because of her last name. This did affect Jocelyn personally however she continued to follow her dream. The second single “Make This Last Forever” did fairly well on radio and the single also contained the non-album track “Lovely.” The album was quite successful for the small market of Freestyle. The ballad “You Are The One” was released, followed by the Donna Summeresque “Big Love” and the remix single. The last single from Lovely would be the non-commercial release of “Only.” “Lovely” gained a fanbase in California, Texas, New York, and Florida but that was only the beginning. Work for the sophomore album began in 1995. Glenn Gutierrez who had ended a relationship at the time was inspired to do this best work yet. It inspired him to write the famous lines “the radio plays our favorite song, and it’s what keeps me holding on…” and the rest was history. Released in spring of 1996 “Do You Miss Me” became an instant #1 hit on radio stations. Soon enough majors were watching and joint ventures were becoming a label trend. Freestyle pioneer Joey Gardner at the time was linked to Tommy Boy Music was interested in signing Jocelyn. Born was the joint venture between Classifed/Timber!/Tommy Boy. 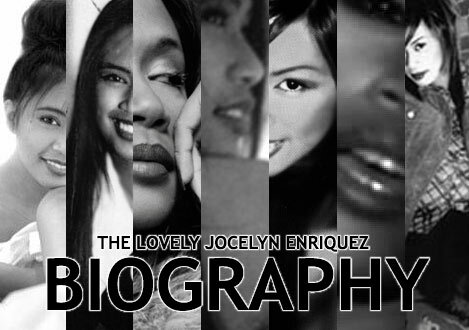 At this time the sophomore album “Jocelyn” was already completed but due to the joint venture the album was postponed release to re-record, remix, re-edit, and add and remove tracks from the album. In this process the “Do You Miss Me” remixes were released and internationally released. “Do You Miss Me” was heard in radio all over Asia, Europe, and South America. The single also managed to hit the Top 40 mark on Billboards Hot 100. In late fall of 1996 an ignored reoccurring high school injury finally took its toll on Jocelyn. She was unable to walk properly and surgery was the only way out. At this time “A Little Bit of Ecstasy” was being prepared for release and the video was to be shot. She ended up shooting the video just standing in one spot the whole time and the dance sequence had to be removed. Her surgery followed and soon she on her way to recovery and therapy. Nominated for a Bammie (San Francisco’s version of the Grammies) in January 1997 she won the award and in February “A Little Bit of Ecstasy” was released. The single held the #1 on Billboards Club chart for 6 weeks, and the Classified/Timber!/Tommy Boy version of “Jocelyn” was released in May.